GENEVA/DUBAI (Reuters) - President Hassan Rouhani said on Monday that he would try to clinch a nuclear deal with world powers despite opposition from some quarters in Iran. But his government must sell any agreement to hardliners in the Islamic Republic who are wary of any rapprochement with the West. "Some people may not like to see the sanctions lifted. Their numbers are few, and they want to muddy the water," Rouhani, widely seen as a pragmatist, told a gathering of officials at a Central Bank seminar in Tehran. He appeared to refer to hardliners including senior commanders of the elite Revolutionary Guards. 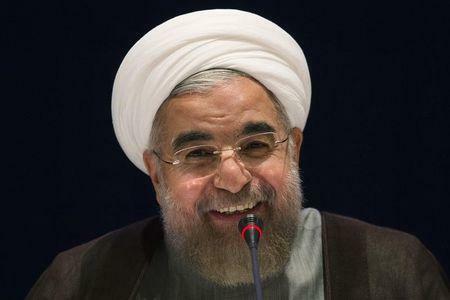 "The overwhelming majority of our nation - intellectuals, academics, theologians, the greats, and the leadership - are in favor of getting the sanctions removed," Rouhani said. U.S. and Iranian negotiators began a two-day meeting in Geneva before wider talks between Iran and six global powers in the same city on Wednesday on how to end the 12-year dispute over Tehran's nuclear program. They aim to reach an agreement on the substance of a final accord by late March as more time would likely be needed to reach a consensus on the technical details. Wendy Sherman, acting U.S. deputy secretary of state, and Abbas Araqchi, Iran's deputy foreign minister, led their delegations in Monday's talks. Iran's official IRNA quoted an unnamed member of Tehran's delegation as saying uranium enrichment and how to remove sanctions were sticking points. "Some differences have been bridged, some others haven't. There is need for more diplomacy and consultations," he said. Iran's reluctance to scale back its capacity to enrich uranium - which can have both civilian and military uses - has drawn international sanctions that have severely hurt its economy. Tehran denies Western allegations it has been seeking to develop the capability to assemble nuclear weapons. In a new report, the International Crisis Group think-tank said an agreement was within reach if both sides showed more flexibility on enrichment capacity and sanctions relief. But it warned that differences "remain sharp and overcoming them will grow more difficult with time, as the voices of skeptics get louder," referring to hardliners on both sides.